GEODIS’ Distribution & Express Line of Business has launched a new online portal to assist its 60,000 customers with their shipment management. The new version of the portal, which has been fully operational for some weeks now, has been completely upgraded with maximum security measures put in place. Since January, GEODIS’ 60,000 Distribution & Express customers have had access to a new, exclusively redesigned shipment management portal. More up-to-date, more intuitive and completely secure, this new website helps customers better manage their operations. The portal has been designed for ease of use and to give comprehensive access to information from order preparation, access to invoices, to temperature and CO2 emissions monitoring, regulated goods management (hazardous materials or wines & spirits), tracking of shipments and proof of delivery reception (signature and image). Security for the site, which on average has over 77,000 customer accounts, with two million individual sessions and 15,000 active users each day, has also been upgraded to satisfy the increasingly stringent demands of customers. GEODIS’ aim in undertaking this major overhaul is to bring the portal into compliance with the highest web security standards. “Our constant aim is to provide our customers with reliable, secure IT solutions ensuring better visibility and responsiveness,” explains Olivier Mélot, Executive Vice President for Distribution & Express at GEODIS. The new customer portal also boasts many upgraded features including enhanced management for pickup requests; more efficient shipment tracking; customized screens and improved order integration. These improvements make the new site the cornerstone of the GEODIS’ customers journey, and a major contributor to an enhanced GEODIS customer experience. Hamburg, 26 March 2018 – SAL Heavy Lift announces a brand new regular service linking West, South and East Africa with North Europe, the Arabian Gulf and Indian sub-Continent. SAL Heavy Lift, is pleased to announce a new regular Africa service in response to the quickly developing oil and gas, refining and transport infrastructure sectors, particularly in West Africa. Scheduled to provide clients a minimum of two sailings per month in each direction via The Cape of Good Hope, SAL’s famous service quality will now reach even further and offer clients even more options including calls to either North/South America or Australia on inducement. SAL views a regular Africa service as a logical extension of its existing regular North Europe to Far East service (via Suez) which has been providing clients with high quality engineered shipping services for over 35 years. GEODIS is pleased to announce the appointment of Ursula Breull as new National Sales Manager for GEODIS Freight Forwarding Denmark. Based in Kastrup , Copenhagen, she will lead the national business development activities and teams, with the goal of effectively driving business development performance forward to meet high growth targets. 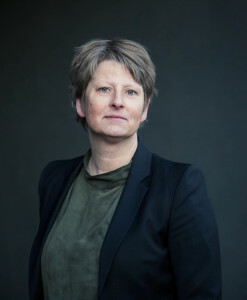 After a first cooperation with GEODIS from 2006 to 2010, Ursula Breull joined the company in 2015. Ursula has played an important part in her positions in driving key strategies for business development in the organization. Prior to joining GEODIS, she held positions at leading transport and logistics companies. Ursula har arbejdet for GEODIS i 2006 til 2010 og igen fra 2015. Hun kommer med erfaring fra ledende virksomheder på det internationale logistikmarked, og hun har allerede spillet en vigtig rolle for GEODIS’ strategiske forretningsudvikling. Administrerende direktør Gitte Hjortflod hilser forfremmelsen velkommen: ”Ursula har med sine mange års erfaring og sin uddannelsesmæssige baggrund bidraget betydeligt til den succes, vi har hos vores kunder. Det glæder mig, at vi nu skal se en af vores mest erfarne professionelle på posten”. Kempten, March 16, 2018. 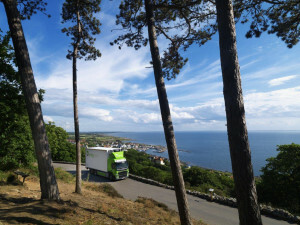 The European Food Network is creating a new connection to Scandinavia and enhancing the European shipping network for fo od products. Bring Frigo, the Scandinavian market leader for food logistics, is now a forwarding agent for Norway, Sweden, and Finland. Since the beginning of the year, transit times on the daily routes to Norway and Sweden in particular have become one day shorter on average. From the Hamburg platform, groupage shipments now regularly need just two to four days to reach Norway and one to three days to Sweden. Bring Frigo is BRC-certified, employs 960 people at more than 30 locations across Scandinavia, and has over 1,100,000 cubic meters of storage area. Its fleet numbers some 1,300 vehicles that are classified for food transport. With 13 partners, 11 forwarding agents, and regular scheduled services between 34 countries, the European Food Network is Europe’s most comprehensive network for food transport. This cooperation was founded in 2013 under the system leadership of Dachser. A family-owned company headquartered in Kempten, Germany, Dachser is a leading supplier of logistics services worldwide. Dachser offers comprehensive transport logistics, warehousing, and customer-specific services in two business fields: Dachser Air & Sea Logistics and Dachser Road Logistics. The latter consists of two business lines: Dachser European Logistics and Dachser Food Logistics. Comprehensive contract-logistics services and industry-specific solutions round out the company’s offerings. A seamless shipping network—both in Europe and overseas—and fully integrated IT systems ensure intelligent logistics solutions worldwide. Thanks to some 27,450 employees at 409 locations all over the globe, Dachser generated revenue of 5.71 billion euros in 2016. That same year, the logistics provider handled a total of 80 million shipments weighing 38.2 million metric tons. Country organizations represent Dachser in 43 countries. Kempten, March 8, 2018. With Dachser Rail Services, the global logistics provider offers an alternative to air and sea freight that has been optimized for ti me and cost. The services use the “New Silk Road” and the trans-Siberian route to connect the economic areas of China and Europe. “Rail is always a sensible option when sea freight is too slow and air freight too expensive,” says Thomas Krüger, Managing Director Air & Sea Logistics EMEA at Dachser. For example, shipping by rail between Asia and Europe takes just 16 to 22 days, whereas sea freight takes somewhere between 28 and 36 days. And as for greenhouse gas emissions, rail transport emits up to 90 percent less CO2 than shipping by air. Using its tightly knit European network of 363 locations plus 68 partner locations, Dachser organizes overland transportation of LCL and FCL packages from 37 European countries. It consolidates them at four centrally located rail terminals—Duisburg and Hamburg, Warsaw, and Vienna/Bratislava—loads them safely and securely into containers, and hands them off to the rail operators. Then the containers embark on a nearly 11,000 kilometer journey. The trains take one of two routes: the southern corridor, or “New Silk Road,” winds through Belarus and Russia before crossing Kazakhstan to arrive in China. The second route is the north corridor, or trans-Siberian route. After passing through Belarus and Siberia, it turns south, heading down through northeast China before arriving at the country’s commercial centers. At the destination railway station in rural China, Dachser handles customs clearance and arranges for onward transport in China and Asia via its own Air & Sea Logistics network or partners. The company has 49 offices in eleven countries in the Asia Pacific region. Dachser Rail Services are naturally offered for both directions: for LCL and FCL shipments to China, but also from China to Europe. Rail Service Desks are available in Shanghai, Shenzen, and Hamburg exclusively for Dachser customers to make bookings. Firm transit times, seamless shipment tracking upon request, and a high frequency of departures throughout the week help ensure transparency and aid in planning. GEODIS improves efficiency and accuracy for online women’s apparel retailer while addressing labor market concerns. 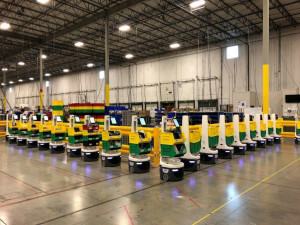 To address the record-low unemployment rate (~3%) and the strain on labor during peak seasons, GEODIS and a major online women’s apparel client partnered to pilot collaborative each-picking using 30 autonomous mobile robots from Locus Robotics in a 139,000 square foot (13,000 sqm) warehouse in Indianapolis. The location handles over 30,000 SKUs and uses a manual picking process that is complex and leaves little margin for error. The results have been staggering. Now, 80% of the units are picked to the robots daily. Employee productivity has doubled and there was at least 50% reduction in time to train new employees. GEODIS looks to expand the partnership with Locus Robotics in more warehouses with their retail and ecommerce customers. The success of the pilot started with simplifying GEODIS employee training. Rather than spending hours in the classroom, team members were instructed on how to pick to the robots on the warehouse floor, completing the training within a matter of minutes. The messaging on the robots is displayed in their preferred languages allowing for faster absorption of training and a decrease in picking errors. Picking units to the robots also reduced physical demand by eliminating the need to pull pick carts and decreasing overall travel. GEODIS is a Supply Chain Operator ranking among the top companies in the field in Europe and the World. GEODIS, owned by SNCF Logistics, which in turn is a business line of the SNCF Group, is ranked as the number four logistics provider in Europe and number seven at a worldwide level. GEODIS is also listed as a “Leader” in Gartner’s 2016 Magic Quadrant of Worldwide 3PLs. GEODIS’ reach includes a direct presence in 67 countries and a global network spanning over 120 countries. With its five Lines of Business (Supply Chain Optimization, Freight Forwarding, Contract Logistics, Distribution & Express, and Road Transport), GEODIS manages its customers’ Supply Chain by providing end to end solutions enabled by over 39,500 employees, its infrastructure, its processes and systems. In 2016, GEODIS recorded €8 billion in sales. Locus Robotics transforms e-commerce fulfillment operations with innovative autonomous mobile robotics technology that significantly improves worker productivity and operational efficiency, while lowering operating expense. Locus’ award-winning solution was purpose-built with one thing in mind: to improve warehouse productivity. LocusBots work collaboratively with warehouse workers to drive greater throughput, reduced costs and unparalleled flexibility in moving inventory and orders through a fulfillment center, even during peak periods. A new building named “OCEAN BREEZE” has been constructed adjacent to the existing building for further strengthening and expanding our seafarer’s training facility known as “K” Line Maritime Academy Philippines (hereafter “KLMA (Phil)”). 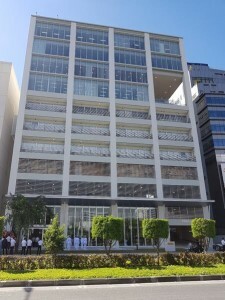 The building is located in Pasay City, and on March 2, 2018, with many distinguished Japanese and Philippine government officials, as w ell as many overseas and maritime officials attending, an opening ceremony was successfully held. Our efforts for developing seafarers in The Philippines was first started in 1993 by the establishment of “K” Line Maritime Training Corporation (KMTC), later known as “KLMA (Phil)” within our own “KLINE BUILDING” completed in February 2008. Currently we are accepting 10,000 trainees per year, and as one of the main pillars to support “safe operations and environmental conservation” in accordance with our company’s business foundation, we will stably provide high quality seafarers as well as further strengthening and nurturing their training. “OCEAN BREEZE” is an eleven-story complex building that combines a seafarer’s clinic equipped with the very latest medical equipment, a dormitory that can accommodate 225 trainees (total 282 trainees together with existing building) and office space on the upper floor. It is a symbolic place for securing and training the seafarers for our “K” Line fleet, in response to the ever-increasing demand Filipino seafarers. Inside the building, synergies within the “K” Line group are also expected as inclusion of occupancy by group companies such as seafarer manning companies, marine agents and logistics company, including our own representative office. “K” Line Group is working together to secure and train skilled seafarers so that we can continuously provide high-quality logistics based on safe navigation. Evergreen Line introduces paperless Bill of Lading (B/L) and dispatch documentation via its ShipmentLink digital portal, enhancing connectivity for exporters and importers with banks, insurers, regulators, customs and port authorities. Evergreen is the first container carrier to integrate with Bolero’s proven electronic Bill of Lading (eBL) solution. March 01, 2018 – Evergreen, in line with its avowed mission to deliver the highest standards of customer service through continual improvement, has introduced two new Intelligent Services – the intelligent i-B/L (Bill of Lading) and i-Dispatch, a solution that delivers documents associated with such transactions. These new services, provided in partnership with Bolero International, will lower shippers’ costs while making data transfer more accurate, efficient, reliable and secure. Accessed via the line’s established ShipmentLink portal, the ability to achieve paperless data exchange among all parties concerned in a shipment will significantly simplify supply chain linkages. Bolero’s eBL technology has been integrated into Evergreen’s ShipmentLink customer portal, delivering the benefits of almost 20 years’ experience of proven, secure and accepted electronic transfer of Bills of Lading (B/Ls) in the shipping community. The advantages of this new integration for Evergreen’s container shippers start with the rapid issuance and transmission of the i-B/L. This is helpful in all cases but particularly for short-sea shipments when a paper Bill of Lading can sometimes arrive later than the vessel, making it difficult for importers to pick up cargo on a timely basis. However the advantages of i-B/L do not end there. The paperless environment allows reviews and alterations to be undertaken online and speeds up cash-flow by avoiding the delays associated with traditional documents. Carriers can release goods and banks can release payment to shippers far more quickly. With Bolero’s assistance, the new i-Dispatch function facilitates electronic exchange of the wide range of documentation associated with shipments in addition to the B/L, including packing lists, commercial invoices, certificates of origin and other customs-related credentials, licenses and inspection reports. This avoids the dangers of loss, fraudulent copying and errors associated with paper documents and where necessary, transmission can be in an encrypted form. Evergreen is pleased therefore to add i-B/L and i-Dispatch to its existing suite of electronic functions, including shipment booking and tracking, for the use of customers via Evergreen ShipmentLink. Partnership with Bolero, introducing new digital functionality, marks the expansion of the established online portal into high-volume container trades. Evergreen Line remains committed to bringing technology to the aid of its customers wherever and whenever possible. Whether in the realm of digitalization, environmental sustainability or efficiencies in transport operations, the line will continue to be at the forefront of innovation and the extension of service capability.